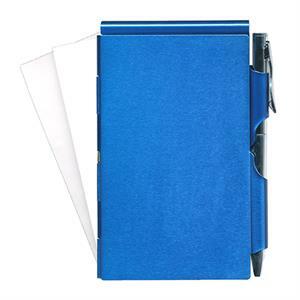 Compact memo pad and holder with mini ballpoint pen. Blue metal with easy tear off notes; slender silver pen slips into place to keep case closed and pen secure. Includes three notepads. 3" x 4.25". Perfect note-taking accessory for purse, pocket, or briefcase.